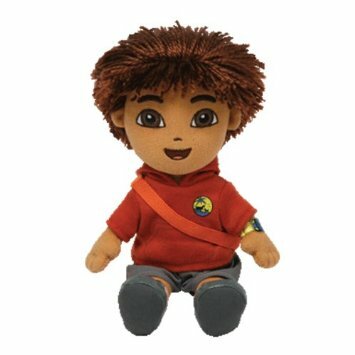 Diego is made from a tan coloured material with embroidered brown eyes and an embroidered mouth and nose. He has fuzzy brown hair and wears a red hooded top with dark grey shorts. On his feet are a pair of red and grey trainers and he carries an orange shoulder backpack. Diego was released in July 2011. He is based on the character from the Dora the Explorer spin-off, Go Diego Go! This is the 2011, redesigned version of Diego with a red hooded top. There was also a version released in 2006 with a blue t-shirt and beige coloured jacket.